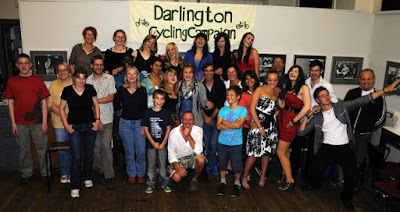 Darlington Cycling Campaign organised a farewell party on Thursday for the many participants of the Beauty and the Bike project. It marked the end of one year of filming the remarkable story of these young women by Darlington Media Group, who hosted the event. Girls from cycling-friendly Bremen in Germany had just spent a week in Darlington exploring what it is like to cycle in a typical British town. Editing now begins in earnest, whilst photographer Phil Dixon will be continuing to document the Darlington girls for a few more weeks. He and German portrait photographer Sabine Bungert are working towards a book about the project, which will also feature an essay by cycling activist and Cycling Campaign member Beatrix Wupperman. The project began a year ago with just one regular cyclist amongst these teenagers. Now there are 13 bikes out on long-term loan, and a waiting list of 7 more. Plans are now afoot to formally constitute the scheme. The film, which will be premiered in December, explores why so many British teenage girls give up cycling – and what needs to be done to reverse the trend. Perhaps these photographs are a clue. They are all regular cyclists, and most are now members of our Campaign. what a set of beautyful young ladies and they ride bikes…this is good. We doing our best. Thanks for your support.